We hope you are excited for our 2013 NON-GMO season coming soon. Our first day of the season will be Wednesday June 5th from noon till 6pm. Hope to see you there. In the meantime, if you are looking to start a wonderful garden this year, then please consider Organic Heirloom seeds from our friends at Kenyon Organics. Thank you and look forward to seeing you all this year! 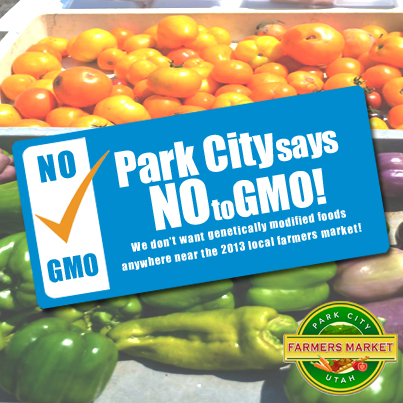 Park City Farmer’s Market says NO to GMO! US lawmakers may not be willing to give the people what they want due to corporate “influencers”, however, the Park City, Utah Farmer’s Market does not bow down to such bologna. We want YOU to know exactly what you are getting when you purchase from the PC Farmer’s Market -YOU have a right to know! That is why the 2013 market will not allow any genetically modified ingredients (GMO’s) by any of our vendors in their products or foods.